In an open letter, comic book veteran Mark Waid gives advice to freelancers while criticizing the "chimpanzee" editors who abuse them. Comic books may be the birthplace of modern superheroes, but behind the scenes, the industry has its own share of controversy. Between Alan Moore's long-standing feud with DC Comics and Batwoman's creative team stepping down over editorial interference, it's clear that many creators aren't satisfied with how publishers currently treat them. Now former DC Comics writer and editor Mark Waid is adding his two cents with an open letter to comic book freelancers, warning that editorial bullying is rampant and that creators must stand up for their creative integrity. "There are a lot of good comics editors out there, probably more than ever, and I applaud them," Waid writes. "But there are, likewise, a growing number of (1) good editors who are not allowed to be good editors by their bosses, and (2) outright chimpanzees. "What I see a lot of freelancers going through today in the work-for-hire arena is just unreal, and the horror stories of personal and professional abuse I'm hearing from the trenches on a regular, almost-daily basis are mind-blowing to me - not only because I'm sympathetic, but because every single one of their experiences is utterly antithetical to the creative process." 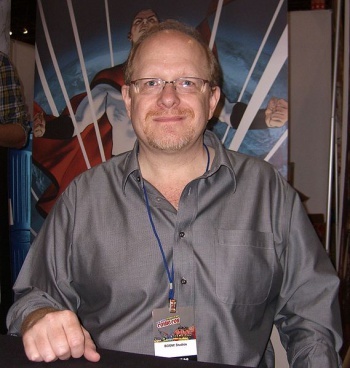 As a 29-year veteran of comic book publishing, Waid's experience lends significant weight to his words. The full post elaborates his thoughts in detail, but what's unique is that Waid isn't just lashing out in vitriolic anger. He seems to be seeking a middle ground, pointing out that editors have a valuable place in the industry and warning that creators can't sacrifice professionalism for righteous indignation. At the same time, he stresses that comic book freelancers have very few people standing up for their rights, which puts the onus on them to speak for themselves. "If you feel like you're practically being hazed, you're not struggling through Business As Usual," Waid says. "If you're fairly new at this, do not let anyone tell you that bullying is excusable in any way whatsoever or that it's part of any 'learning curve' or 'breaking in.' This is a business; you have a right to be treated professionally. "I can - purely off the top of my head - think of at least a dozen freelancers who hit every impossible deadline ever asked of them ... who were pleasant to work with and always professional even if their editor was a jerk ... and who always did exactly what their editors asked them to do, even if it was obvious to a blind man that the quality of the finished work was lessened, because they were trained to believe that their first priority was to serve their editor and do so in a timely manner, and whatever creative voice they brought to the table was secondary. They were good soldiers. They were great soldiers. "All of those people have been unemployed for years. The quality of your work is all that matters."